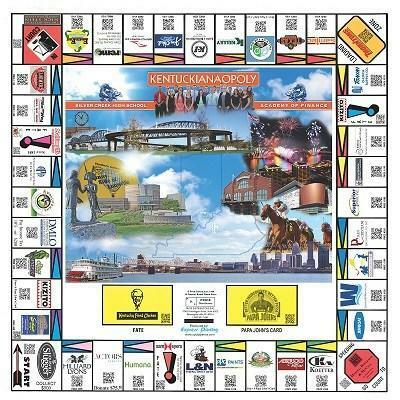 Kentuckianaopoly is a board game that the Silver Creek HS Academy of Finance has worked to create over the past two years. We wanted to give consumers a direct access to a variety of businesses in our area. So, our game highlights the local historic and iconic businesses of Southern Indiana and Louisville, and brings them all to one place where people can use the QR codes that we have implemented to connect to the businesses’ websites. We are selling the games for $25 at SCHS from 11 a.m. – 1 p.m., and you can also find them at venues such as Southern Indiana Visitors Center (Jeffersonville) and the Louisville Water Tower Museum.